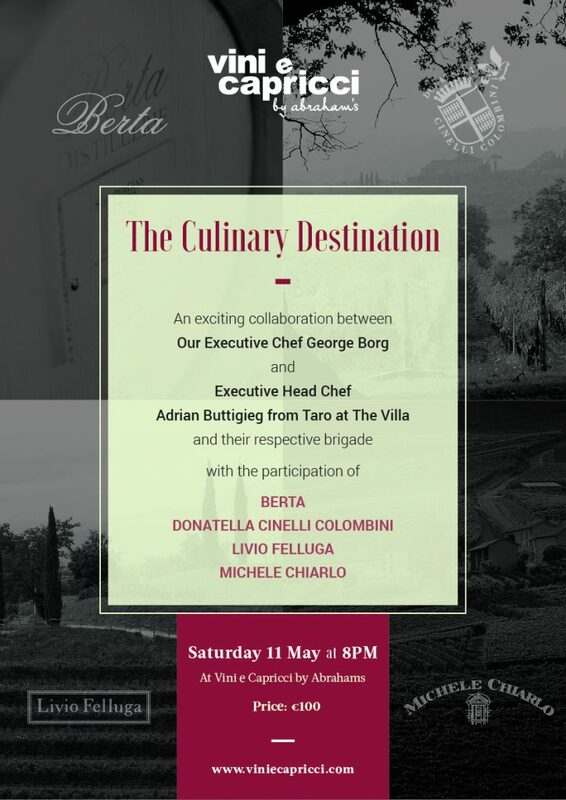 This coming May 11 we will see an exciting collaboration at Vini e Capricci by Abraham’s, where renowned George Borg, Executive Chef of Vini e Capricci, and Adrian Buttigieg, Executive Head Chef of Taro at The Villa, together with their respective brigade, will present a true gastronomic experience to the guests who are to be seated all around Vini e Capricci by Abraham’s. Their strong passion, and creativity in culinary arts will bring a concoction of the finest, freshest ingredients in the manifestation of a 5 course dinner, initiating with canapés and petits fours. The participation of Distillerie Berta, Donatella Cinelli Colombini, Livio Felluga and Michele Chiarlo, prominent distillery and wineries in the world will make this evening a momentous one. If you want to celebrate and witness the marriage of art, culture and food, all on the same evening, then you can’t miss this exclusive dinner at Vini e Capricci – The Culinary Destination. Price for the event is €100 per person.